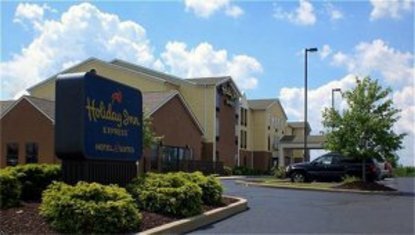 The Holiday Inn Express Cleveland-Streetsboro, Ohio is the destination hotel for the corporate and leisure traveler. Located at exit 187 off the Ohio Turnpike, our hotel is 32 miles from Cleveland Hopkins Airport and 29 miles from Akron Canton Airport. We are conveniently located to major corporate sectors surrounding the Streetsboro area, including Hitachi Medical, Parker Hannefin, L'Oreal and TCP. We are 10 miles away from Aurora, Mantua, Ravenna, Kent, Twinsburg, Macedonia, Stow, and 8 miles away from Geauga Lake and Wildwater Kingdom. We are also 20 minutes from the Cuyahoga Valley National Park. The Holiday Inn Express in Streetsboro, Ohio is proud to offer complimentary high-speed Internet access in all guest rooms and wireless in all public areas for your convenience. And for our leisure guests, we offer an indoor heated pool . Email or call direct with questions regarding group sales, meeting rooms and special package rates. This hotel is committed to providing accessible facilities under the American Disabilities Act. If your accessibility needs are not met, please contact the Hotel Manager on Duty. Should you require additional information regarding accessible facilities for guests with disabilities, please call 1-800-Holiday (U.S. and Canada) or contact the hotel directly. For the hearing impaired, TDD service is available at 1-800-238-5544 within the U.S. and Canada.